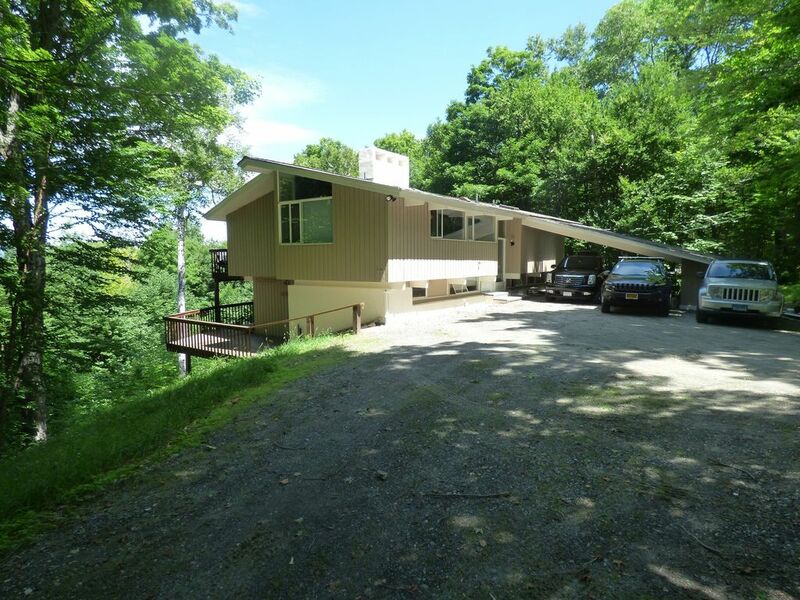 This warm and spacious 3 level 2900 square foot house set on 4.4 acres with 6 bedrooms (13 actual beds) and 4.5 baths is located just off the Stratton Mountain access road. The house is 3.4 miles from Stratton's main lodge. It's a 4 minute drive to Stratton Mountain Country Club and about 1 mile from the Stratton Mountain Golf School. There is an absolutely beautiful view of nearby Bromley mountain which is a 15 minute, 10.7 mile drive. A 16 mile drive will get you to the increasingly popular Mt. Snow in about 25 minutes. The house features 2 Living rooms; 2 dining areas; a kitchen and kitchenette; 2 decks; an outside grilling area; a recreational room with a ping pong table and foosball table; 2 fireplaces and ample couch room for apres ski lounging. 13 individual beds, with bed space for 19 people. I have been skiing since I was 8 years old and own 2 ski shops in New York and Connecticut (Ski Haus). Happily, much of my life has been devoted to the sport. We have had several ski houses over the years... all at Stratton. We bought this one because of it's proximity to Stratton (3 miles from the base), and because it can handle a large group easily. With 3 levels; 2 living rooms; a full kitchen and kitchenette; 2 dining areas; 6 bedrooms and 4 1/2 baths, it can handle up to 18 people comfortably. We ski weekdays and encourage our employees to use the house whenever they can. They do! We have a portable AC unit on the top floor and fans in every room. 2 Living rooms each with fireplaces. Toilet paper, paper towels, cleaning supplies, condiments, spices, coffee filters, etc. 2 decks overlooking nearby Bromley ski resort. ~ 2.1 miles from Stratton Mountain Golf Course. ~ 15.6 miles to the Equinox in Manchester. ~ 18.5 miles from Mount Snow Golf Club. I am the owner of 2 ski and snowboard shops located in New York and Connecticut so please feel free to contact me with any of your winter time needs either before or after your stay with us. This was our second weekend at the house in Feb and we had quickly become acclimated to our move in and setup process. We had a small group again, so the children tried different sleeping arrangements and our dog was now very comfortable sleeping on the main living area. The showers were warm with good water pressure (a necessity when wanting to quickly clean off after being on the mountain). We enjoyed fires and movies in the upstairs living area and a game console was set up on the second floor living room. Ross was once again fast to respond. We had a fun and relaxing weekend. I recommend staying here. The house has a wonderful layout with common rooms on every floor. It has a welcoming feeling and is very clean. The ping pong and foosball tables were a hit with my son, my daughter loved the Netflix account and our dog had trouble deciding what floor to sleep on. The first night we stayed, the temperature outside was close to zero, but it was comfortable inside. It is a quick ride to the base of Stratton, allowing us to always park in Lot 1 (even after dropping skiers off first). The owner, Ross, has been very attentive and fast to respond. This was the second year we returned for a father/child ski weekend. As the house has three floorsThe kids in the dads were able to separate and enjoy some alone time, and familytimeThe kids in the dads were able to separate and enjoy some alone time, and family time. Owners are friendly and helpful. Wonderful home! My friends and I stayed there for a long ski weekend, the house fit all of us perfectly. Lots of room for everyone. Super clean and well maintained home, highly recommend! GREAT way to end 2018 and GREAT way to bring in 2019 - We all loved our stay! What a wonderful way to spend New Years. My Husband and I booked this beautiful home for 5 nights and it was our Christmas gift to both families. We fit 18 people comfortably and were never in each others way. Down stairs area was a great place to have 1 family with children as the bunks worked out perfect. The views were exceptional!!!!!! The house was fully stocked!!!!!!! The fireplace was a huge hit!!! Ross was awesome to work with. I would certainly rent this home again. Only 5 minutes from Stratton Mountain. My siblings and families stayed over Thanksgiving break. At times there were 18 of us and we fit comfortably. The owner was very great at communicating and accommodating. Minimum age requirement to rent is 21. Rates are subject to change until reservation is confirmed. A reservation is considered booked once payment for half of the agreed rental price is paid. Second payment, including a $500 refundable damage deposit, is due at least 21 days prior to check-in. There are no refunds for cancellations but trip cancellation protection can be purchased through VRBO.